Cuckold narrates the captivating story of a Rajput Prince who has to fight for what is his right in Mewar. While the book describes the political turmoil he faces, it also sheds light on his personal life. His wife, the well-known Mira Bai, believes she is married to Lord Krishna and refuses to accept him as her husband. Cuckold, written by Kiran Nagarkar, offers a moving and authoritative read. 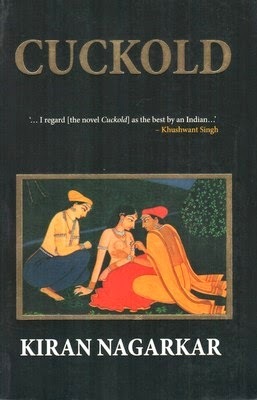 Cuckold is the story of the Rajput prince, Maharaj Kumar, the husband of Mira Bai. The Prince calls himself a cuckold because he discovers that his wife is irrevocably in love with the Lord Krishna. Maharaj Kumar aches for her love and is left unfulfilled due to Mira’s devotion to the Hindu deity. This fictional tale then whirls around the tangled web of politics - vicious battles are fought within the Kingdom to decide on the deserving heir after the King’s death, although the Rajput Kingdom is at the peak of its power. The Prince prepares himself for the battle by planning his strike and defence well in advance. Cuckold weaves history, politics, romantic desire, epics and mysticism together to offer a riveting read. Readers are introduced to the Rajput community’s way of living and their system of valour, sacrifice and honour. The book won Nagarkar the prestigious Sahitya Akademi Award in the year 2000, and has been translated to several other languages. Kiran Nagarkar was born in 1942. He is an Indian author, playwright, screenwriter, and film and drama critic. Nagarkar writes his books with a narrative voice that concentrates mostly on the story and describes its unique niceties and essence. He studied at the Fergusson College, Pune and the S.I.E.S. College, Mumbai. He then worked as an assistant professor, as a journalist and a screenplay writer. Some of the books penned by the author are Saat Sakkam Trechalis (Seven Sixes Are Forty Three), Ravan and Eddie, and The Extras. He has also written the play Bedtime Story and the screenplay of The Broken Circle, The Widow and Her Friends, and The Elephant on the Mouse. He was awarded a scholarship by the city of Munich and he also received a Rockefeller grant. Kiran Nagarkar has acted in the movie Split Wide Open. He currently lives in Mumbai.